Abstract: In occidental countries, peripheral arterial disease (PAD) is an important health issue; however, most subjects are asymptomatic (~50%) and therefore undiagnosed and untreated. Current guidelines recommend screening for PAD in primary care setting using ankle brachial index (ABI) in all patients with cardiovascular risks. This is, however, not performed strictly because the standard Doppler method is cumbersome and time-consuming. Here, we evaluate the accuracy and reproducibility of ABI measurements obtained by an improved automated oscillometric device, the MESI ABPI MD® device, and the standard Doppler method. ABI was measured in random order in a general practice with Doppler probes by two operators separately (ABI_dop) and twice with the MESI ABPI MD device (ABI_mesi). ABI_dop was calculated dividing the highest systolic blood pressure from both tibial and dorsalis pedis arteries by the highest systolic blood pressure of both brachial arteries. ABI_mesi was obtained automatically with simultaneous measurements on three extremities. According to ABI_dop, PAD was present in 10% of the 136 screened subjects (68.2±7.4 years). Interoperator coefficient of variation was 5.5% for ABI_dop, while the intrasubject coefficient of variation for ABI_mesi was 3.0%. ABI_mesi was correlated with ABI_dop (R=0.61, P<0.0001). The difference between the two techniques was 0.06±0.14 with ABI_mesi providing slightly higher values (P<0.0001) and negligible bias across the range (R=0.19, P<0.0001). Therefore, ABI_mesi ≤1 had a sensitivity of 85% and specificity of 96% to detect ABI_dop ≤0.9 and hence PAD. Doppler measurements took seven times longer than MESI ABPI MD measurements to be performed. In conclusion, MESI improved automated oscillometric method and offered a faster and repeatable measurement of ABI with only a small, clinically irrelevant overestimation of ABI value. 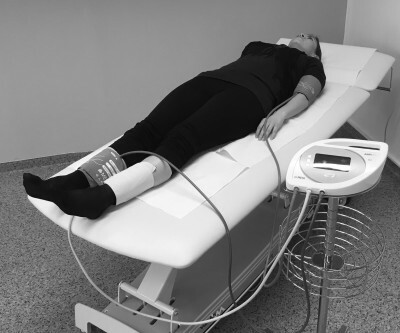 The tested MESI ABPI MD-improved oscillometric system can be used as a screening tool for patients in general practice and would enable family doctors to comply with current guidelines for PAD.